There was a time when I guess other folks might have said I had been abducted by drink. And to be sure, there were days like that. Even weeks. And I suppose a couple of years were kinds like that too. But in all fairness, these last 20 years have been abduction free till last week. I have read about crop circles and I have watched movies about how some space aliens were the architects behind the pyramids. I have even seen pictures of cows being abducted around these parts by saucers flying over these very hills in Bovine. And I have, for all my life, called it all hogwash. But I am going to tell you now, there is something strange happening in Bovine and I have seen it. We have been busy here getting ready for the reunion. I have finished the deck and the community fire pit, and even remodeled our garden so we can feed all those coming to the reunion. Often, I have been working till after dark to finish some of the preparations. Last Sunday night I was working on the yard by the dog house just finishing some raking and putting leaves in a bag when I heard a high pitched whirling sound. At first I thought it was a big ol mosquito because it sounded close. Sort of. It was one of those sounds that you think could be right in your head or a mile away. Just hard to tell. So I kept on raking and a short time later I heard it again. But it was farther off I could tell. It was a nice evening and not yet dark so I took off walking toward the river to see if I could hear it better. I don’t recall how far I got or if I went anywhere because that is about where my recollection ends. It was as if time just stopped for a week and I woke up with a dog liking my face and the sun rising over the hills. I remember jumping up and wondering how I had gotten to be laying on the ground when the last thing I could really recall was hearing the mosquito sounds and thinking I’d go walk down by the river. I asked around to see if anyone missed me and not a soul said anything. It was like the night had gone by and I just fell asleep there on the ground. The world went on without notice. But then the strangest thing of all happened and that is why I am telling you about this. I get up off the ground and walk back inside to the trailer. I see it looks like I left it just before I went outside to rake. I felt strange and I know something was wrong, but I could not put it together. I figured a shower would help so I showered and stood there in front of the mirror making sure I was all still there. I had taken my watch off before I started raking and I picked it up off the bathroom sink and put it back on. The time was right, about six in the morning. But the date was not right. The date said it was the first of the month. When I went out to rake it was eight days earlier. At first I figured it was just something wrong with the watch. 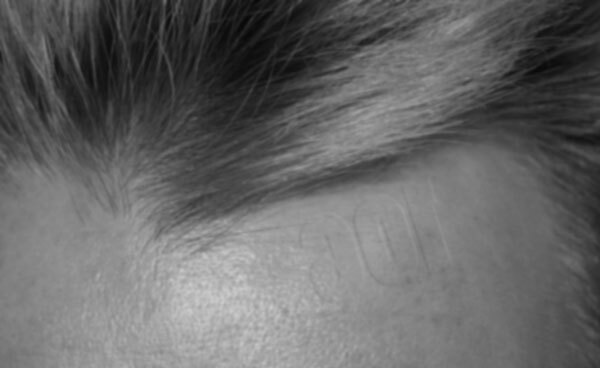 But standing there in front of the mirror I could see a slight indentation in my scalp just below my hairline. It looked like numbers or letters but I had to look close to see it. As soon as I saw it clearly I knew what it was because it was the damn address of the trailer here in Bovine. 106. “What the heck,” I said to myself in the mirror. Of course I was looking at the reflection of the thing so it made sense as a 106. But to someone looking at me, it was a g01 or maybe if I was upside down a 901. I was so scared and there I was thinking about me upside down and trying to read whoever was pushed into my skull. I started screaming. Real loud. Standing there in the bathroom I screamed. And screamed. No one came running to figure out what was going on. I stopped screaming and went outside. I stood on the porch and looked over at the rake laying there on the ground. I looked down toward the river. I listened. Nothing but some birds over in the shrubs by the dog house. Nothing. Just a normal morning. I figured I better write thins down so I don’t forget it is something else should happen. I am back now. And weirdly, life just seems the same here in Bovine. Hotter than all get out and a few folks wandering in and out. It is as if the whole thing was a dream or maybe I somehow woke up in the middle of the night and drank a quart of rum, missed an entire week, and still woke up not recalling a damn thing? I just don’t know. And I am not sure I want to know. I just gotta keep at the raking and cleaning. Today I have been reminiscing about some of the gatherings we have had here on the property and at dad’s old place on the river. I guess nostalgia is a good thing. Some of the memories are just great and they make me smile. Other are a bit confusing and some get me feeling a little down, truth be told. I recall the 82 Bovine Hoedown we had here in town and how excited everyone was to bring some game to play, some food to eat, and some instruments to make music with! Families practicing songs in the cool breeze of a June evening. You could hear them hootin and hollerin from miles away. I recall one family that had a teen with an electric guitar. Good lord it was awful. That kid made more noise in three minutes than most folks make in a year or two. I ain’t sure, but if I recall that summer was the same summer the family had a big blowout and the kid left town real unhappy and carrying a guitar case. I don’t know that I’ve seen him since. I don’t even recall his name, just the screechin ripping through the prairie. I remember that after the hoedown here at the trailer we had a few of the games we had made. One was this silly looking wooden scarecrow with the face cut out. The game was to hit whoever was a standin behind it with a water balloon. The day of the hoedown a kid who didn’t know any better came up to play and I was standing behind the thing. I don’t think the kid really realized what he was doing, he had just seen other folks throwing stuff at me. He had been playing baseball with some friends and he up and through his baseball at me fast as can be! And damn if it didn’t smack me right on the forehead. Knocked me clean off my feet and stone cold out for 10 minutes. Well, I guess that is what happens at hoedowns. 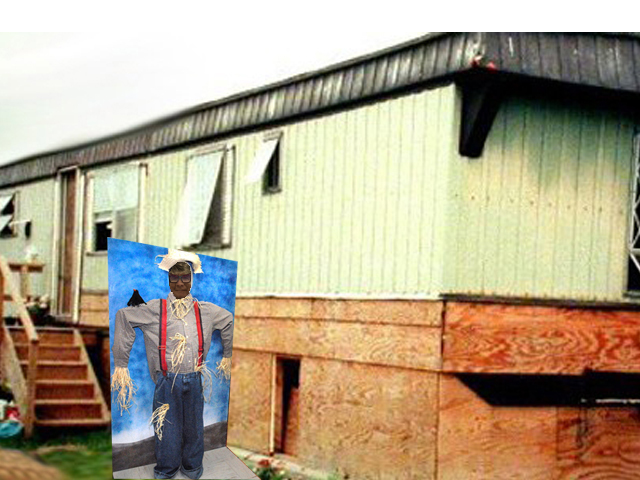 I snapped the picture here of ol Nana standing behind the scarecrow after we got home to the trailer. I suppose our reunion will be sorta like a hoedown? I was also thinking about that old Anny Cow and her damn dance studio. I think that is where little Sally Lou learned to dance? I don’t really recall. 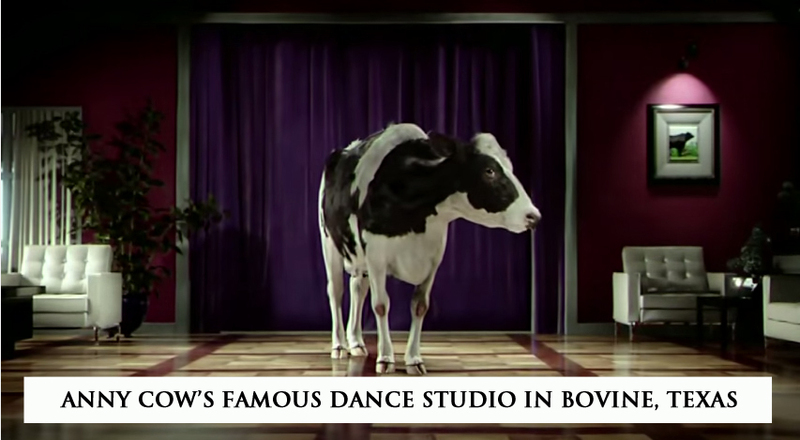 That damn cow was the only cow I have known to own and operate a dance studio? We have had a lot of good lookin and smart cows here in Bovine. But that Anny, she sure had some initiative. Where else but in a place called Bovine could a cow get a business license? Given the recent conversation about the flood of ’57 I figure I would share a few lines from my dad’s (Teddy Burgeron) diary he kept after losing the house in 1957. I thought it was kind of strange that someone who had so recently lost everything would commit to paper these reflections and take the time to make something that could so easily be swept away with just a bit more than normal rainfall. Well, there ain’t no explaining somethings and I think that is what my pa thought too. Maybe his way of reconciling his loss was to wonder about things on something tangible like paper. It is hard to say. I have several diaries that he kept. Some are partly filled and some are completely full. Some writing is deep and thoughtful and others are drunken ramblings that are very hard to follow and downright disturbing at times. The floods here in Texas washed a lot of memories and hopes and dreams downstream with them. My pa was one of the casualties in more ways than one. This particular part of his diary is from March 12th, 1958. It took lots of stuff they say. Now I can’t reach it with 10,000 hoses. Life just ain’t f*&^%$# fair. This is a post from my sister, Bella. Hello I’m Bella Burgeron. My parents didn’t give me middle names but that’s okay because I have a different middle name every day. Most people ask why. I think I should tell you the story. So my parents had a store with personalized products with names on them. They sold mugs, key chains, shirts, sweatshirts, toothbrushes, globes and gloves. But they went out of business and we still had all the products. And every day I use a different mug, key chain, shirt, sweatshirt, toothbrush, globe, and glove. I’m eight years old and today my middle name is Rosalina. 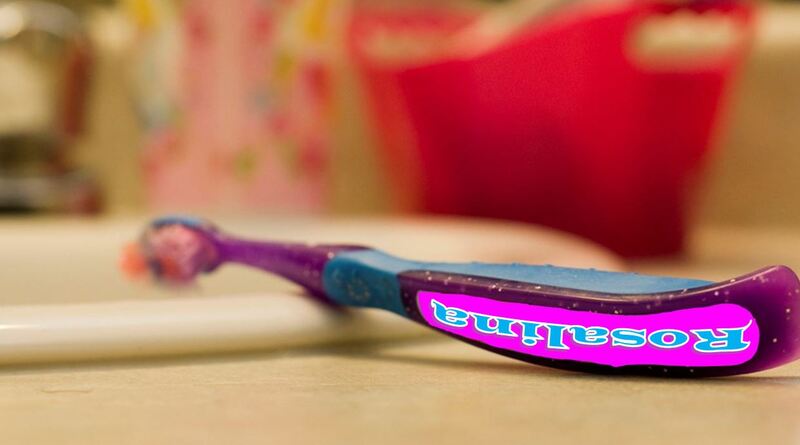 Bella Rosalina’s toothbrush at the Sink. You can click on this picture to see and read Bella’s journal. My favorite day of the week is Saturday when my sister and I get to visit Grandpa Don. Our mom and dad both work on Saturdays and they feel bad that they aren’t spending “quality time” with us and this is troublesome to them. Mom usually stops at Bovine Bonanza on the way to Grandpa’s to get gas and she’ll buy something to keep us occupied so Grandpa doesn’t have to work as hard at minding us. I think it also holds back Mom and Dad’s guilty feelings about leaving us at Grandpa’s all day. Over the years, we’ve gotten finger paints, puzzles, magazines, a label machine, gardening hand tools, and anything that’s close to the front of the store; lots of sale items over the years. We really have fun at Grandpa’s trailer home but I don’t let on because I’d like us to continue to get interesting things. Anyway, my name is Bonnie Burgeron and my sister is Bella. We just got our first computer this week from our Nana and our parents have been so busy, with each of them working two jobs, that they let me unpack it and set it up. We have some computers at school but we mostly play games on them and test on them. One of our teachers at school, Coach Nakamura, writes a journal on his computer about keeping healthy habits with exercise and healthy eating. He also gives instructions for making a new origami project every week and he shares that with us during third period gym. I share these with Bella and show her how to make them. She loves folding paper; anything, napkins, receipts, pages ripped out of the phone book and she has all of those origami animals in different sizes all on her dresser. Coach Nakamura prints it right off of the internet from his website so you can see it is from his own journal online. His website is called nakamurastrong.wordpress.com and it has an archive (which means a history) of all of his posts (which means when he writes something on his website) so you can go all the way back to his first origami project and not just the new one from last week which was a seal. When I told Bella that Mom and Dad were going to start writing an online journal like Coach Nakamura she got to be very excited even though I told her that they wouldn’t be writing about origami. 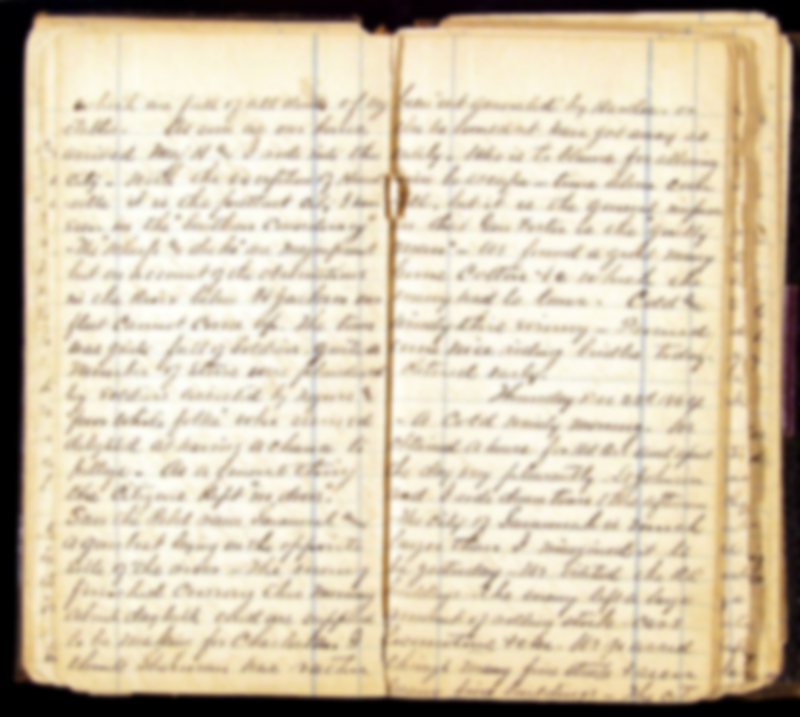 She decided that day to start a diary of her own. Since I put that idea in her mind I feel responsible for putting her writings online so that’s what I’m going to do. I really didn’t plan on writing online journal posts but on reconsideration, I wonder if Mom and Dad will even have the time, so I feel a bit obligated to write for them. This is my first writing for them and for Nana. I’m the oldest child in our house (I turned 14 yesterday on May 24th), so I pitch in quite a bit making meals, taking care of my sister, etc. I sometimes walk with my sister to Bovine Bonanza after school to do the grocery shopping for the house. I also take care of the yard — the front yard and the backyard. But my best days are Saturdays. Grandpa Don takes care of everything. 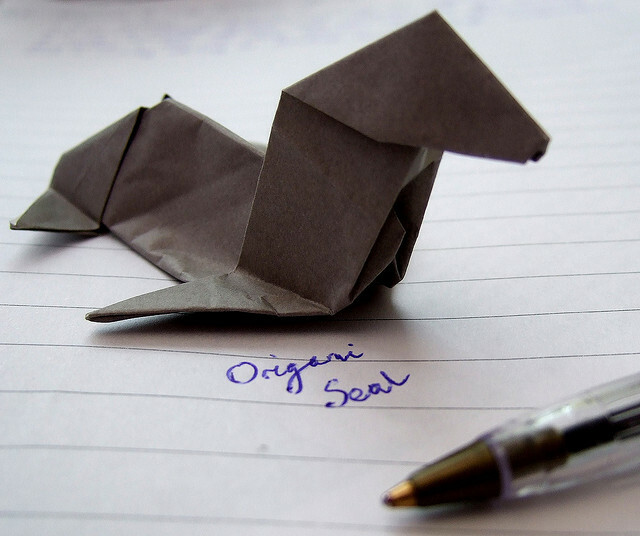 Origami seal that Bella made yesterday. She’s real good at this sort of thing. Here in Bovine we have a lot of folks. I think Bovine now has nearly 350 people. Now that ain’t like Austin or Dallas, but in Bovine, a group of more than about ten folks gets us worried. I don’t know why that is, but we ain’t big city folk. I suppose that is why were are here in Bovine. This morning I headed out to get the mail and I was reminded of one of my favorite stories from my pa and grandpa. I seen this damn mailbox every day and I usually get to thinking about my pa when I do. I miss him. Back before the flood of 57 the house was in a different spot on the river. Of course, no one could have known that it was not such a great spot, but you know how disasters are, everything seems really great right before them and then, well, everything falls apart. Dad had completed the ditch and like I said, he owned some acres along the river. Well, in the spring of 53 he got some neighbors. He always said they were Finnish. I was just a kid and I always imagined that he said they were “finished” and for a while I wondered if somehow we were not? Like some folks just got done better than others. Kinda like bread that don’t get baked all the way, some folks were doughier inside than others and you know what that can be like. Pretty awful. They were from somewhere far away anyway and I imagined that maybe folks from places other than Bovine or Texas were just cooked better. As it turns out, folks in Bovine are cooked just fine. Thank goodness. So the new neighbors also had the last name of Bergeron. Dad could not figure it out. “How the hell can they have our name and we don’t even know where they hell they come from,” dad would ask the coffee cup some days. No one had an answer. I remember thinking that it was a real cool coincidence that we had the same last name and that we might even be related to them somehow and maybe we had come from some exotic far away land where people were cooked a little longer and more finished. Well, it did not take long for the trouble to start. Dad was a couple of years away from losing his home and his mind and the new neighbors, and the damn postman as dad would remind us, were about to cause some trouble. As dad told it, the mailboxes and our same last name caused all kinds of trouble with the Internal Revenue Service and the local chapter of the American Legion. Here in Bovine we never had actual address numbers. We were just the “Bergerons” in Bovine. If you wanted to send us mail that was all you needed to write. Ol’ Tom the mailman for the last 20 years knew everyone and where they lived. We didn’t need no stinking numbers. Well, I guess the neighbors had some tax troubles and when they moved in dad started getting their mail. Dad put the mail addressed to them in their mailbox and they denied that the mail was for them. They said they had never had any tax trouble. So there dad was with this mail addressed to him and the letters said he owed a lot of money he did not have. Well, dad knew it was not his and the neighbors refused to take the mail and ol’ Tom was stuck in the middle. Tom was also a member of the Foreign Legion in town and he told the members dad was evading taxes. Well, as you can imagine, they kicked pa out of the legion. That helped a bit with his drinking later on, but initially he was devastated. All three of his friends hung out there all day and night and all of a sudden he couldn’t hang out with them. It was Tom’s idea to get us number on our mailboxes. He said in the big cites everyone had a number. I remember thinking how important all those folks must be to have their own numbers! Well, dad kept getting the mail for the Bergerons, of course, and ol’ Tom had to really pay attention because the mail to both places usually just said, The Bergerons. 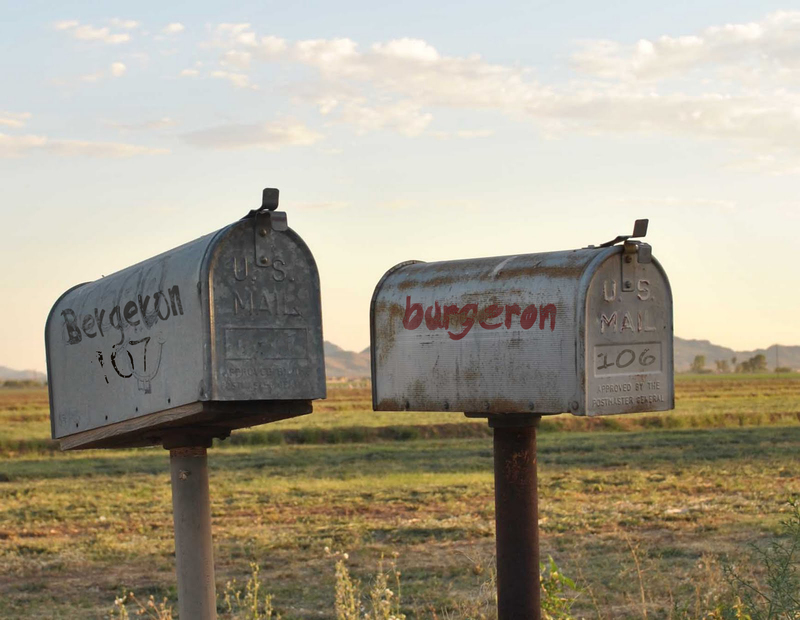 After a couple of years of continually getting the wrong mail, and just before the flood, dad had finally had enough and went down to the county courthouse in Laredo and changed our name to Burgeron. Why he only chose to change one letter I don’t know. That was long ago but I still remember seeing the mailboxes as a kid and it always reminded me of people who cooked long enough and had been finished. I missed the rendezvous over the weekend as I was off to the south fixing the damn cattle fences. Them cows are dumber than rocks. Who would eat barbed wire? Well, one of our Bergeron Cows would, that’s who. I spend most of the weekend dancing around the patties and the horns trying to fix all the wire along almost 5 miles of fence line. I am guessing we are still a go here with all these new arrivals and some of the stories being told. And what a fine treat to see so many old photographs of family. We can fit a bunch in the trailer. Seems small but there is plenty of room. Six years ago when the twister hit Bovine we had about 30 folks here. Some was in the dog house and others on the dirt. But we had food and room for all of them. I gotta clean this place up a bit and make sure all of the details are in place before I can really get to the real work we must get to doing. I am inspired by the old Roxy Louridge finding her way with the GiFaChrome. I think she took some of the images of the flood when the house was washed away? I don’t remember. That was a long time ago. My name is Don Bergeron. I live here. I moved outta here twice when I got married. Both times I moved to Bovine and stayed there. Once with Nancy for three years and once with Gretta. Gretta left after a couple days of married and I come back here. My grandpa William come here in 1927 when we was right on the Pretty Wide River. He got the land dirt cheap and got a bunch of it. I guess the river was flowing by and it watered all the land for a mile around and there were good times. The big flood of 34 pushed the river into a new channel nearly a mile west toward Bovine and grandpa William’s crops went dry. That was the end of that. My dad was born to grandpa William’s second wife. Her name was Margie. My dad’s name was Teddy and he went off to war and become a land engineer. When he come back he had it in his mind to get that damn Pretty River flowin back here near grandpa’s land. Back then the tractors was slow and it took him nearly three years to get the channel dug out. The big flood of 57 came racing down from the mountains and right into my dad’s newly dug channel and it took his tractor about fourteen miles down toward Mexico. It also dug the channel out so close to the house that it took it right along with the tractor. We had water again but we had to move in with grandpa. The flood of 58 took the river way back toward Bovine again and we been dryer than lint ever since. A fire in 63 burned grandpa’s old house. Well, that was about it for dad. He bought this used up old house trailer we been in ever since. Dad passed on about ten years back and now it’s just us. The Bergerons. You can help us plan on this Google Doc. You can see our progress below.